After having a beautiful double revenge of the FIBs over the Badgers and Packers last week, it was followed up with one of the worst football weekends in the Frank the Tank household in awhile with the Illini and Bears both losing games that were more than winnable. I noted last week that the road trip to Iowa City for Illinois was going to be a proverbial trap game since Kirk Ferentz just seems to have our number and that proved to be more than correct in an ugly 10-6 loss. The Hawkeyes kept our running game in check while we had virtually no passing attack until Eddie McGee came in to close out the game. Despite the fact that McGee threw a poor interception in the red zone on the final Illini drive that probably would have turned the outcome of the game the other way, his passing skills to even get Illinois into that position (as well as a gem of a throw to Joe Morgan – who has always thought that Ryne Sandberg and Roberto Alomar could never hold a candle to him as second basemen – for an 82-yard touchdown that was called back on account of an illegal formation penalty) is forcing Ron Zook to start out all of his press conferences with a “Juice is our quarterback” speech. Speaking of the Zooker, the recipient of a new contract extension from Ron Guenther made a few calls that must have had Florida Gators fans giggling by choosing to accept penalties on third down as opposed to declining them to force fourth downs not once, but twice. The first time backfired into the only touchdown by either team in the game, while the second time resulted in an Iowa first down conversion. This made me flashback to last year’s game against Indiana when Zook decided to go for a 2-point conversion on the first touchdown in the first quarter of the game for absolutely no reason at all, which we subsequently failed on (and we of course lost the game by 1 point). Now, I love that Ron Zook has brought Illinois back to football respectability way ahead of schedule, but these calls are just simply off-the-wall – it isn’t even about overall technical game strategy, but rather plain-old common sense. Anyway, the Illini are still in line to get to a pretty good bowl, but in order to make the Rose Bowl now, we’re going to have to win out for the rest of the season (which means beating Michigan in a monster prime time game next week and #1 Ohio State in Columbus). The fact that this is still a possibility shows how far Illini football has come over the course of the year, yet it’s still tough to stomach that we lost a very winnable game on Saturday. The Bears, of course, couldn’t help but to pile onto that frustration on Sunday. Ever since the Vikings selected Adrian Peterson in the NFL Draft last spring, I’ve been telling everyone that would listen to me that Minnesota is the team that scares me the most in the NFC North since he’s such a special player. Well, he backed my thoughts up and then some by just shredding the Bears’ defensive and special teams units. Honestly, I believe that Peterson is better situated to become an NFL superstar than even Reggie Bush since the former Sooner has the size and strength to pound the ball inside as an every down back as well as having breakaway speed to the outside and past the line of scrimmage. I have no clue as to why Minnesota is still having him split carries with Chester Taylor. While Devin Hester did everything he could to keep the Bears in the game with yet another touchdown return and finally getting an offensive pass play call for him that worked perfectly for another touchdown (I’m pretty sure that the Bears can just have Hester sprint down the field all day and he’ll burn anyone that’s on him), the rest of the team just couldn’t contain Peterson. 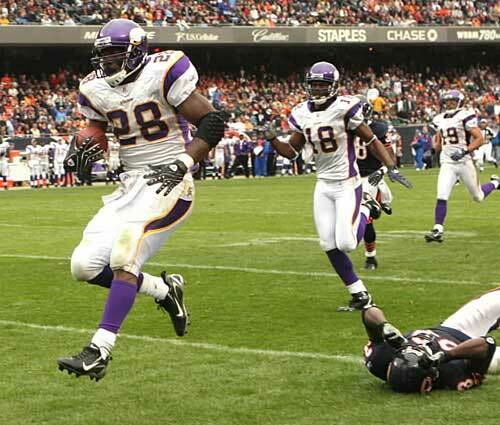 This season just has a bad feeling to it – the Bears improbably stormed back with two touchdowns against the Vikings in four minutes to tie the game only to blow it within the final minute and a half. Can the Bears go 8-2 the rest of the way to get to the 10-6 level that will probably be required to make the playoffs? Unfortunately, I don’t have much faith in that (and even more unfortunately, I’ll continue to watch since I’m a glutton for punishment). (1) And Simpson Makes Four! (Mark Tupper Weblog) – After a year of continuously grim recruiting news for Bruce Weber and Illini basketball, this past weekend saw oral commitments to Champaign from four high-profile recruits. Will this answer all of the concerns about Weber’s recruiting skills? Let’s hope so. (2) Indiana Punishes Sampson Over Recruiting Calls (ESPN.com) – Speaking of old oral commitments from recruits to Weber, have I ever told you how much I hate Satan’s Spawn? (3) Local Recruits Infuse Illinois with ‘Swagger’ (Washington Post) – The Washington Post takes a look at how D.C. recruits have catapulted the Illini football program. (4) Can Anyone Explain Dane Cook to Me? (Freakonomics Blog – New York Times) – If University of Chicago economists can’t figure this out, there’s no hope for the rest of us. What a god he is and he is only just starting, if he can avoid more injuries…dammmm. PS…NOT A FAN OF DANE COOK EITHER! !